It’s a very nutty Mother’s Day this year. Wonder what that is? It’s cake batter. 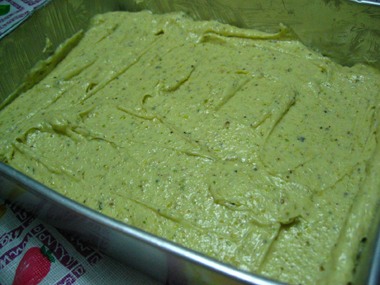 Pistachio cake batter to be specific. Wanted to bake something for mum on this special day and chanced upon this recipe online a few weeks back via The Food Section. It’s actually a recipe from the London River Cafe. The recipe can be found in their cookbook, Italian Easy: Recipes from the London River Cafe. Anyway this recipe is really easy but expensive. That’s because shelled pistachio nuts cost more. I bought 250g for about $9. My ingredients came about $20 in total… But that’s because I bought extra unsalted butter (for my chocolate chip cookies to be baked soon) and flour. Try out this recipe if you like nuts as much as I do. Hmmm but you won’t really taste any nuts while eating it, besides the topping of course. 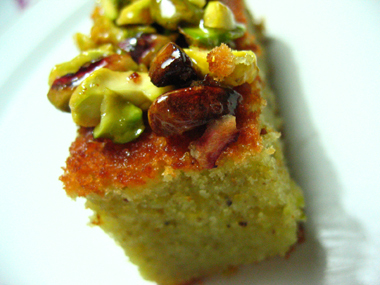 a closeup shot – can you see the lovely shiny glaze on the pistachio? Tada! 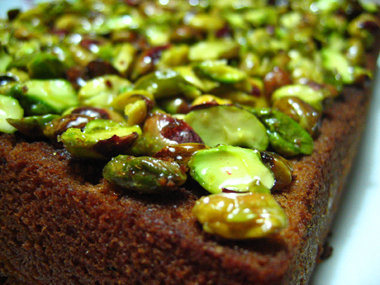 Sorry for the sudden influx of pistachio cake photos. I just had to put them up. Especially those cut slices. 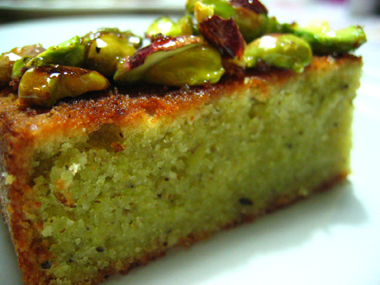 I wanted to capture and show you guys the lovely hue of the pistachios and the colour of the cake. The topping really completes the cake, not just in terms of aesthetics. It gives the cake that extra zing. The taste I mean. The lemon glaze gives a tangy tart feel to the cake while you bite into it. Very refreshing. I’m going to eat it with yoghurt later. It looks as if it would go well with yoghurt. Just to let you know, mum did like the cake and so did both my younger bro and sis. They liked it so much and now there’s only about half left. Well I do have a hungry family i guess. Or maybe just one with a huge appetite. Like me. * Didn’t know where in the world I could get organic eggs so I used normal ones. * For those in Singapore and have difficulty getting shelled pistachios, go to Phoon Huat. * I couldn’t find a pan of the required size so I just used one that i had at home. Just make sure that when you pour your batter, it doesn’t touch the brim. As long as it’s half or 3/4 full, it’s fine. I’m really glad I got to try out this recipe! 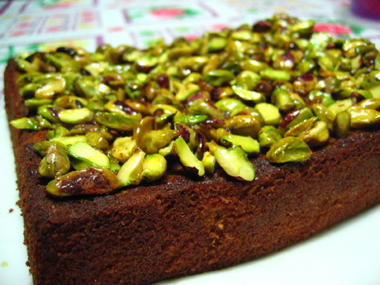 Been wanting to bake this cake but kept delaying it because I couldn’t find shelled pistachios… I’m glad it turned out fine though. Definitely one of my favourites. Reminds me of the hazelnut torte my aunt made last time. Lovely. My aunt is an excellent baker. In fact, when i was younger, I used to help her out in the kitchen when she was baking bread/cakes etc. You can say I have some good ‘baker’ genes. Pardon my corny reference. It’s late. Ms. Baker will get some shut-eye now… zZzZzZz……..
i baked the pizza too! thanks for hte recipe! the pizza turned out good! i managed to save the dough in time. almost wanted to throw it away! haha knead till pek chek! glad your pizza came out well. ahh hawaiian pizza.. love those chunks of pineapple. scrumptious… i wanna try making a purely cheese pizza. i know i’ve eaten it a couple of times at italian restaurants. they use gorgonzola, ricotta, pecorina etc… all those fantastic italian cheeses. abs. delightful! heehee do try it out~ U will love it!!!!! Awesome looking cake. Loved the contrast between the brown crust and the green centre. YUMMY!!! Hi Ms. Baker, I love your site!The two River Cafes are not affiliated, and Phoon Huat sells vanilla beans sometimes. If you can, use the beans instead of the essence; the difference is quite phenomenal! hey mich, the recipe i got from the indian chefs that time was very vague and measurements weren’t exact so I searched online for the recipe closest to it and which uses the same ingredients. i can send that one to you. heh too bad we don’t have our own tandoor. but i guess the oven works fine =) what’s your email? thanks =) they do? i’ve honestly never seen vanilla beans sold in sg before. but i guess they’re quite ex. ya? well i’ll be sure to try some out soon enough, when i do find the beans themselves. but i do find it amazing how those miniscule black seeds can enhance the flavour by several notches! I think the last time I bought them from Phoon Huat they were over a dollar each. Not that cheap, but really worth it. Heh basically anything to do with baking doesn’t cost cheap most of the time – quality ones I mean. But I’d rather choose quality over quantity anytime. So someday if I got the money, I might just make brownies or molten choc cake with Valrhona or Godiva chocolate. Imagine that! Yea… the green is lovely isn’t it? I love pistachios. But I couldn’t find the better quality ones. The ones more suited for baking. Those are really perfect. Smooth, perfect even green tone and more nutty and crunchy. My aunt bought them in bulk last time from a wholesaler but it was about $40 per kg i think. Yes there is a rivercafe here. just that it isn’t related to the london one. see http://www.rivercafe.com.sg for more details. Actually you don’t always have to compromise on quality. There are some value for money places if you know where to look. Maybe not Valrhona or Godiva, but there’re excellent sources for chocolate in the remoter corners of the island. Do you have a good molten chocolate cake recipe? Was supposed to try it for Mother’s Day but plans changed at the last minute. See blog for details. Yea, i know that and i’m constantly on the look out. In fact, when i have a recipe that calls for dark chocolate, i normally use the one carrefour sells. it’s at their chocolate section. 2 bars of 200g each costs only $4.90. but the quality is really good. it works well for me. better than those of the same price. Heh only when i have enough $ to splurge, then i’ll use hershey’s. But their cocoa works well for me, rather indispensible. molten chocolate cake… hmmm i do have recipes for that but alas i haven’t tried making it before so I don’t know which works best. maybe i’ll let you know when i’ve tried? I’ve not tried the ones from Carrefour; I get mine from Phoon Huat – not sure how much they charge though. Sure thing! I’ll update you if I try one before that. I came to your site via the photo contest hosted by I Heart Bacon and I thought the picture you entered was wonderful–strange, beautiful, and oddly appetizing. Usually baking is a passion I repress and must live out vicariously. 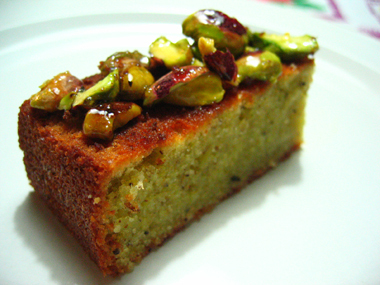 That pistachio cake though, I’m going to have to try it. Your cake turned out really nice. Great color, the nut topping very appetizing. Love your site and all the great pictures. I’m going to put a link to you on my blog at http://www.cookingwithkristina.com. Keep cooking. the gal who bakes! and cooks!